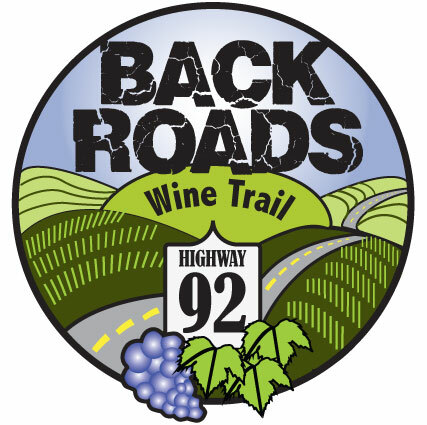 Back Roads Wine Trail is a collaborative effort by wineries located on or near Highway 92 to bring awareness to wine tourists about their wineries. Back Roads Wine Trail got its name from an evening of brainstorming ideas over a glass (or two) of wine at the Nearwood Winery tasting room in Knoxville. Back Roads are off the beaten path, allowing your imagination to run a little wild with the possibility of adventure. Back Roads aren’t in the city, even though they are only about an hour drive from Des Moines, Iowa. Back Roads run along rolling green hills, picturesque pastures where cattle and horses graze, winding streams, vineyards and lightly traveled highways. Get out of the city congestion to travel the Back Roads and enjoy some Iowa wine along the way. The Back Roads Wine Trail is officially recognized by the Iowa Wine and Beer Promotion Board, an arm of the Iowa tourism office and the Iowa Economic Development Authority. Download the Iowa Beer and Wine free app for both iOS and Android devices with photos, maps, and a search feature. All four wineries are a brief 15-minute drive between each other.